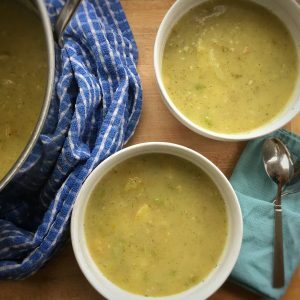 Nothing says cozy like potato soup and this might be the simplest, quickest potato soup to make. No fancy ingredients, no frills. A tip for making the cooking process go a little smoother is to prep everything before you get started. That way once you get cooking on the stove you will just be able to focus on each part of the directions. There is a fancy name for this but I will spare you and say, prep your ingredients so cooking is a breeze. Heat the olive oil in a large pot over medium high heat. Add onions and celery to the pot and cook for 5 minutes, stirring occasionally. Add garlic to the pan and continue to cook on medium heat for 3 minutes, or until everything begins to brown slightly. Add in the potatoes, salt and pepper. Stir to combine. Pour the water over the potatoes and bring to a boil. Once boiling, lower the heat and let simmer for 6-7 minutes or until the potatoes are just fork tender. You don’t want to overcook the potatoes. Remove from the heat- Using either an immersion blender or a regular blender you want to blend about ¾ of the soup. You want the soup to have a smooth base but still have some chunks. Return to heat, on the lowest setting while you add the dill relish and dried dill. Stir until combined and serve while hot! Enjoy!